Ray, wave and quantum concepts are central to diverse and seemingly incompatible models of light. Each model particularizes a specific ''manifestation'' of light, and then corresponds to adequate physical assumptions and formal approximations, whose domains of applicability are well-established. Accordingly each model comprises its own set of geometric and dynamic postulates with the pertinent mathematical means. At a basic level, the book is a complete introduction to the Wigner optics, which bridges between ray and wave optics, offering the optical phase space as the ambience and the Wigner function based technique as the mathematical machinery to accommodate between the two opposite extremes of light representation: the localized ray of geometrical optics and the unlocalized wave function of wave optics. At a parallel level, the analogies with other branches of both classical and quantum physics, like classical and quantum mechanics, quantum optics, signal theory as well as magnetic optics, are evidenced by pertinent comments and/or rigorous mathematics. So, the Lie algebra and group methods are introduced and explained through the elementary optical systems within both the ray and wave optics contexts, the former being related to the symplectic group and the latter to the metaplectic group. In a like manner, the Wigner function is introduced by following the original issue to individualize a phase space representation of quantum mechanics, which is mirrored by the issue to individualize a local frequency spectrum within the signal theory context. 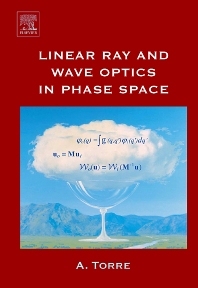 The basic analogy with the optics of charged particles inherently underlying the ray-optics picture in phase space is also evidenced within the wave-optics picture in the Wigner phase space. Amalia Torre received her degree in physics at the University of Naples. She is a member of the Theory Group of the Department of Applied Physics at the ENEA Research Center of Frascati, Rome. Her research interests include Free Electron Laser, optics and special functions. She is presently involved in two research projects concerning the Extreme Ultra-Violet Lithography (FIRB project) and the X-ray production via Free Electron Laser operation (SPARC project).